This post tells you everything you need to know about witnessing the Changing of the Guard at Buckingham Palace, when to arrive, finding the best spots, as well as explaining all aspects of the event. Viewing the Changing of the Guard is free. In fact, it’s #1 on our top 10 list of free things to do in London. For even more ways to save, read our Guide to London on a Budget. 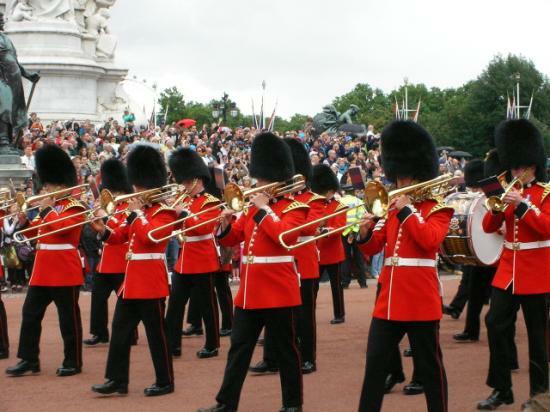 TIP: The Changing of the Guard is a part of our Tour of Westminster and London in a Day Tours. The Changing of the Guard is a formal ceremony in which a group of soldiers is relieved of their duties by a new batch of soldiers. The Queen’s Guard soldiers actually work in shifts of 2 hours each, which means new guards begin their shift every 2 hours. When we talking about The Changing of the Guard, we are referring to the replacement of the entire group (who have been sharing the 2-hour shifts between them) with a new group of soldiers, who will then take it in turn to work their own 2-hour shifts. Although guards technically change every 2 hours, it is the changing of each larger group that is referred to when discussing the Changing of the Guard and it is only during this change that guests will see the marching band, parade, etc. IMPORTANT NOTE: This is a rough outline of the ceremony. In recent months, due to security concerns, the ceremony has been subject to cancellations and alterations – one of which means that oftentimes there is no musical support marching with the Guards. The ‘new’ Guard form up and are inspected just outside Wellington Barracks (their base near St. James’ Park). While the Guard is being inspected, a band stationed at the Barracks will oftentimes play. One of the groups of ‘old’ Guard’s – those who are done with their shifts – who have been stationed at St. James’ Palace, will form up in Friary Court and then will leave the Palace in a formation and head down the Mall toward Buckingham Palace. They will oftentimes be led down the road by a marching band. At the same time, the ‘old’ Guard stationed at Buckingham Palace will queue up in the courtyard just in front of the Palace. The ‘new’ Guards at the Barracks will be led to Buckingham Palace where, by now, both the ‘old’ Guards of Buckingham Palace and St. James’ Palace are waiting in formation. Once in place, the ‘old’ Guard and the ‘new’ Guard present their arms to one another. The Captains of each group of Guard will march toward one another and there, the keys to Buckingham Palace exchange hands. This part of the ceremony takes place completely behind the gates of the palace. Usually, throughout all of this, the band (made up of 35 musicians, usually belonging to one of the Queens Guard regiments), being instructed by the Director of Music, plays music to entertain the massive crowds of people that will have come from all around the world to watch this procedure. In addition to the music, there are also Guards parading the colours (or flags) of their respective regiment, while all the soldiers are inspected and counted. Once the inspection has subsided and the keys are in the hand of the ‘new’ Captain, the ‘new’ Guard are marched into their positions, at both Buckingham and St. James’ Palaces. The ‘old’ Guard are matched back to Wellington Barracks and are led, usually, by the band. NOTE: Although the band plays a lot of traditional music – particularly when the ‘old’ and ‘new’ Guards are being led to the gates of Buckingham Palace – they occasionally will branch out into some unexpected tunes. For example, it’s not uncommon for Michael Jackson or Game of Thrones theme music to be heard! BEST PLACES TO WATCH THE CHANGING OF THE GUARD? It’s very important to get one thing straight. There is nowhere to watch the entire event. You will need to choose which area is best for you. There are 5 essential places for people to watch the Changing of the Guard. We explain each in detail with the pros and cons of each location below the image. The Mall – The main road approaching Buckingham Palace from St. James’s Palace. The Victoria Memorial – Large memorial statue fronting Buckingham Palace. Buckingham Palace Gates – As close as one can get to the Palace. The Wellington Barracks – On the edge of St. James’ Park on Birdcage Walk. If you want to watch the very beginning of the ceremony, this is where you want to be! In this courtyard outside St. James’ Palace, the Old Guard (and occasionally the band) gather before they kick off the Ceremony by walking down the Mall. This is a great place to go if you just want a glimpse of the Guards, rather than watching the entire event. Note, however, that this location can get very crowded as a lot of tour guides bring their groups here so make sure you come early! You can follow the procession down the Mall (our next option) all the way to Buckingham Palace. Below is a video of what you may see (assuming the band is present). NOTE: This is where we take our groups to see the parade from St. James’s Palace to Buckingham Palace! This tends to be where tour guides take their groups to see the ceremony as The Mall gives guests a close-up view of the parade. Also, there are very rarely barriers on this road which means the guards walk right in front of you, so there’s nothing to block your view/photographs. This location also gives guests the option to leave once the parade has finished, as you will not be trapped at the gates outside the Palace. The only downside here is that, occasionally, there is no marching band present during the parade. Should you wish, you could even walk along the Mall beside them (but never in front of them…always remember: they won’t stop! ), down toward the Palace and experience the rest of the ceremony. The Victoria Memorial (map) – any of the 4 closest Underground stations. This statue has a great position outside the Palace and offers two views: one to the south side, where the ‘new’ Guard will be arriving, and other at the back (west side) that offers a view directly to the gates outside Buckingham Palace. The memorial is elevated which means views are better than just standing on the road and sometimes it’s possible to see both the parade and the action in the Palace courtyard. However, if crowds are big outside the Palace then the view into the courtyard is restricted. Also, it gets quite busy here as well, so coming early is a must, and many times once the ceremony begins, you will not be able to leave, regardless of whether you can see anything or not. NOTE: You will want to stand on the side of the Memorial facing Buckingham Palace, though anywhere on the memorial will afford you nice views. Buckingham Palace Gates (map) – use any of the 4 closest Underground stations. NOTE: This area is the most crowded! This is as close as you can get to Buckingham Palace which means this is where the majority of people come. Providing you get here early enough, you will have a great view of the part of the Changing Ceremony that takes place in the courtyard. The Google 360 view below is just one of the views from the palace gates. However, there are drawbacks here as crowds are huge, which means coming early is essential, and there is no leaving once the ceremony has begun. Also, here you will only be able to see a snippet of the parade, but all of the ceremony in the middle. Many visitors are surprised to find that once the Guards are behind the gates to Buckingham Palace, there is a lot of marching and counting but very little fanfare or performance. So for this reason, some people (not all!) find this middle part of the ceremony to be a bit stale. This is a great place to be if you just want a taste of the Ceremony. Coming here means guests can see the ‘new’ Guard prepare for their shift and also hear the marching band as they warm up for the ceremony (when playing). Once the Guards march you are then free to leave and go elsewhere. Watch the band lead the new guard out of Wellington Barracks. Crowds here are usually smaller but if you want to see as much of the total ceremony as possible, then this is not the place to do it. However, this is a really great spot for those who want to get a taste of the guards and the marching band, do not like large crowds, as well as a great spot for families with younger children. But – as always – to get a good view, good history, and some good information about the Queens Guard in its’ entirety, join us on our Westminster City Tour! Whenever the Changing of the Guard is taking place, our tour groups will get the up close and personal experience of standing on the Mall as the Guards walk past. We also avoid all the crowds and any obstructions that could get in the way of our photos! We’ll take the hassle out of the planning for you, so come along with us! WHEN DOES THE CHANGING OF THE GUARD TAKE PLACE? Any day that the ceremony takes place, the public is welcome to watch! The Changing of the Guard schedule is dependent on season and weather. It is always worth taking a peek at that schedule in advance as ceremonies can be canceled/added/amended owing to any number of events or disruptions that could be taking place in London. Here are helpful hints on planning your visit to witness the Changing. In 2018, from August to May, the ceremony takes place on Mondays, Wednesdays, Fridays, and Sundays. In June and July 2018, the ceremony occurs 7 days a week, though it is highly recommended that you check the schedule for any exceptions. Officially, the Changing begins at 11:00. However, Guards begin to leave the Royal Barracks and St. James Palace by 10:30. The Changing will not take place in bad weather. If it is raining, chances are there will be no ceremony. If the weather is a bit changeable, police officers stationed around Buckingham Palace and the Victoria Memorial can be approached and asked if the Changing is going to be canceled. Join us on our Westminster Walking Tour as we take in the Changing of the Guard ceremony. IS THERE A WAY TO SEE IF THE CHANGING OF THE GUARD IS TAKING PLACE? Surprisingly, the Buckingham Palace website is not the most reliable place to check out the schedule. We prefer to rely on information from the websites of The Household Division of the Seven British Army Regiments serving Her Majesty or ChangingGuardguard.com. There are a number of reasons why the Changing of the Guard may not take place, but the most common reason is bad weather. The ceremony never takes place in horrible weather so if there’s a storm or heavy rain, it’s unlikely the ceremony will happen. The decision about whether or not the ceremony will take place owing to the weather is made around 10:30 so you can ask police officers in the area if they have heard from the soldiers and they can likely give you an update. Another way to check if the ceremony has been canceled is to look at the Queen’s Guard outside Buckingham Palace. If they are standing outside the guard boxes (blue-grey boxes positioned outside the Palace) then the Ceremony should be happening. If they are INSIDE the boxes then that means the weather is bad enough they’ve been taken off the post which means a Ceremony is highly unlikely. As a mark of respect – Occasionally, in reverence and remembrance, the Ceremony will not take place after tragic events such as terrorist attacks, the death of members of the royal family or other heads of state. Security – We have found that recent terror activities in Europe have meant that the schedule of the Changing of the Guard has changed because of security concerns. WHAT TIME DO I NEED TO GET THERE FOR A GOOD SPOT? This greatly depends on the time of year you visit and where it is you intend to stand. In the summer season, some visitors will arrive at the gates to Buckingham Palace or to the Victoria Memorial as early as 9:30! Earlier is better during this time of year. Guests, who are here in the winter months and wish to stand at the Palace gates or on the Memorial will find you can arrive 15-30 minutes before and still obtain for yourself a reasonable viewing spot. If you wish to view the Guards marching from the Mall or Spur Road, you will find it much easier to secure a good location here. In the winter months, simply give yourself a few minutes to get into place. During summer, arrive earlier but 15-30 minutes should be sufficient. Here you will be competing with tour groups (or maybe you’ll be with us!) so you’ll want to get here at least 15 minutes ahead of time. Most visitors don’t come here so it’s busy but not crowded. This starts to get busy fast. You’ll want to arrive at least 30 minutes early, though we suggest arriving even earlier to get the best possible spots. This fills up the quickest (although you’ll notice it’s not our favourite spot) so coming around an hour early is recommended. Again, you’ll only be competing for space with tour groups so you don’t have to arrive super early to catch this one. 15 minutes ahead of time is fine. During the off-season, you only need to arrive early if you wish to watch outside Buckingham Palace. We would suggest arriving 30 minutes early to stand here. As for the other three – in general, you can get there around 10 minutes ahead of time and be fine! WHICH ARE THE NEAREST UNDERGROUND STATIONS? If you are not familiar with the subway in London, then be sure to read our guide to using the London Underground as well as tips on choosing an Oyster Cards. If you are considering purchasing a ticket for a hop-on-hop-off bus in London, then know that all companies have stops that service Buckingham Palace and the Changing of the Guards. The Queen’s Guard (or King’s Guard if the reigning monarch is male) is the name given to the soldiers responsible for the protection of the official royal residences in the United Kingdom. The responsibilities and jobs of today’s Queen’s Guard, has its roots back to the 17th century, during the reign of King Charles II. Although the British Army has regiments of guards pre-dating the Restoration, these regiments began guarding the Sovereign’s palaces in the 1660s. Today, the Queen’s Guard is based in London and provides soldiers outside Buckingham Palace, St. James’s Palace, Clarence House, the Tower of London and Windsor Castle. Occasionally there are Guards also located in Scotland at Holyrood House or in Edinburgh. It’s also worth noting that all Queen’s Guard soldiers are actual soldiers. Many assume their role to be purely ceremonial but all of the Guards are members of the infantry division of the British Army and are all, therefore, actual active serving soldiers. Are all the Queen’s Guard Soldiers the Same? Grenadier Guards – Founded in 1656, this is the most senior regiment of the Guard’s division. Coldstream Guards – Founded in 1650, this is the oldest part of the Guards Division and is the oldest regiment of the British Army to be in active service. Scots Guards – Incorporated into the British Army in 1686, the Scot’s Guards originally began as bodyguards of King Charles I of England and Scotland. Irish Guards – Founded in 1900, this is one of only two Irish Infantry regiments remaining in the British Army. Welsh Guards – Active since 1915, this is the newest regiment of the Guards Division. In the warmer months, Queen’s Guard soldiers wear the traditional red tunic, black and red trousers, and the distinctive bearskin hats. In the cooler months, the red tunic is replaced by a gray jacket. The overall uniform is standard, but there are subtle differences in the detail of the uniform depending on which part of the Guard’s Division the soldier comes from. Grenadier Guards – Buttons on the tunic are equally spaced, their collar has a grenade design on it and the plume in their hat is white. Coldstream Guards – Buttons on the tunic are in groups of two, their collar has a star-shaped badge on it and the plume in their hat is red. Scots Guards – Buttons on the tunic are in groups of three, their collar has a Scottish thistle on it and there is no plume in their hat. Irish Guards – Buttons on their tunic are in groups of four, their collar has a shamrock on it and the plume in their hat is blue. Welsh Guards – Buttons on their tunic are in groups of five, their collar has a leek on it and the plume in their hat is green and white. WILL ANY OF YOUR TOURS STOP AT THE CHANGING OF THE GUARD? Yes! For all All-In-One Tours or Westminster Tours that run on days the Changing takes place, we will absolutely stop to get a good view and take some photographs. If you go on your own, you might want to consider our self-guided Royal London Tour. For those of you who want to see it all, there are two smaller guard changes that take place in London daily. These changes are performed by members of the Queens Life Guard (Horse Guards) at an area called Horse Guards Parade, in Whitehall. The Changing takes place at 11:00 daily, or 10:00 on Sundays. Much smaller than the Changing of the Guard at Buckingham Palace, the entire ceremony only takes around 30 minutes. Also, at 16:00 (4 pm) there will be a ‘Four O’Clock Parade’ where the majority of the Mounted Guards are taken off the post for the day and security is trimmed down to just a few sentries. This ceremony, where the Queens Life Guard are inspected and counted, is also free to view by the public. TIP: If coming on our Westminster or All-In-One Tours we can usually catch the Horse Guards heading from their barracks to Horse Guards Parade, which means you can see parts of both the Changing of the Queens Life Guard as well as the Changing of the Queens Guard.